After a tumultuous 70 minutes of screen time, “Sugar,” a Dominican immigrant to the United States pauses to watch his laundry. The camera pushes in just enough so that you can see it’s red, white, and blue, endlessly spinning around and around. Whether it’s meant as a joke or a metaphor I’m not sure, but it certainly seems to capture Sugar’s mood. America is rich and vibrant and active, but there’s also a lot of churn without any forward progress. And if you’re the shirt, then America might just chew you up and spit you out. Spoiler alert: I was pleasantly surprised by a development in the second half. Consider this a spoiler warning for the rest of this review. If you trust me, take my recommendation and go see Sugar. Sugar starts off as a baseball movie. It opens in the Dominican Republic at a feeder camp for the Kansas City Roya... I mean Knights. Here, hot Dominican athletes practice baseball every day and “baseball English” every night (“I got it I got it”). “Sugar,” (played by an introspective and sympathetic Algenis Perez Soto) is the latest great Dominican hope to be summoned to America to pitch in the minor leagues. At his farewell party his community places all their hopes and dreams on his shoulders. He brushes off the boasts of a former great hope who washed out and now sells cheap cell phone chargers, oblivious to the dramatic irony and foreshadowing. America is strange and exciting, but also scary and weird. The food is too sweet (even for Sugar) and the language barrier proves to be pretty daunting. The Dominican players know the phrase “French toast” but are afraid to order eggs because they can’t understand the waitress’ question: “scrambled, over easy, or sunny-side up?” Sugar does better than his peers, but it’s still hard. Phoenix diners are nothing compared to the culture shock of living in small-town Iowa, which comes next for Sugar. (What is it with Iowa and baseball movies, anyway?) Sugar is a beautiful movie, thanks to Iowa. The cinematography and settings are lush and humid — you can practically feel the rich and heavy air. Many scenes take place at the Bridgetown ballfield, with a graceful steel span in background. At dusk it’s lit up like every night game is a county fair. There is also beauty and isolation at the house where he stays. Calling home, he looks out a window on the lush green hills, rolling for acres and acres with no bustle in sight. It’s peaceful, but definitely not for all tastes, and not for Sugar’s. The people in Iowa are outwardly kind, but formal and uptight. Sugar’s host family immediately lays down the ground rules — curfews, music, girls. The girls he meets are the hardest thing to understand. They smile at him like the girls in Dominican Republic do, but when he shows up for a date, the smile turns out to have been for Jesus, not Sugar. That piece of Americana seems like a particularly cruel bait-and-switch to an immigrant. In Iowa, Sugar is finally forced to confront his limitations. 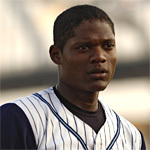 He was arguably the best pitcher in the DR; a big fish in a small pond. But baseball’s best and brightest come to America from all over the world, and suddenly “the best” is all too relative a term. Sugar has a couple of good games, but he doesn’t get better. And when his Iowa team introduces their newest pitcher — a younger, more likeable, gregarious hopeful from back in the Dominican Republic, Sugar feels washed up. The movie’s Sugar high peaks relatively quickly and then spirals down into failure, desperation and despair. The new kid gets his first strikeout even quicker than Sugar. Sugar sees that the “Welcome to America” routine that made him feel so welcome is just rote patter used on all the foreign kids who come here. Soon he feels pressure to try performance enhancers. It feels like Sugar is about to end too soon — and in a way it is does because Sugar stops being a baseball movie and becomes an immigrant movie instead. Sugar gives up the game and tries to make it as an illegal immigrant, taking jobs where he can, trying to connect with his home by seeking out Spanish-speaking neighbors, Western Union moneygrams, and familiar smells and textures. What is most shocking about Sugar is that it looks so much like a feel-good sports film. Compare it to The Rookie for example, in which the plucky upstart hero is not a foreigner but rather “too old” for the sport. The familiar storyline establishes the big lifelong dream, then the golden opportunity. The second act shows the harsh reality, the disappointment, and eventually the montages of hard work. That leads to the big moment of inspiration or luck that turns the corner and lets the hero’s dream come true. Sugar follows the formula to a T, up to the harsh reality. When Sugar gives up his diamond dreams you wonder whether it will be a change of heart or a twist of fate that brings him around again. But Sugar isn’t that kind of movie, which means it’s unlike any movie about following your dreams that I can name. I like follow-your-dream movies. To see something that flouts the convention is shocking, yet it didn’t make me dislike the movie at all. To force the story to fit the formula would have required a contrivance that wouldn’t have fit with the characters, and I probably would not have liked it. But when a movie manages to push my buttons without doing it gratuitously, then I find I like it all the more, even if it makes me uncomfortable in some way. The fact that someone can tell a story that I find realistic but dramatically unfair is admirable. In The Rookie, Dennis Quaid comes to terms with that unhappy truth, and fate rewards him with a little taste of his childhood dream. But life isn’t always like The Rookie. Sometimes it’s like Sugar. Instead of pitching in the majors, you end up doing your own laundry down at the corner laundromat, pondering freedom, dreams, and opportunity. Sugar is joyful, sad, and thought-provoking. It deserves an appreciative audience. Go see it.